A star chart is a graphic device or diagram which shows the night sky as seen from Earth. They are one of the oldest types of written or carved communication. There is a claim for a prehistoric carving as the first known star chart, but the evidence is not clear. Star charts occur in Babylonian and Ancient Egyptian wall decorations and writing. In the ancient world, knowledge was needed for practical reasons and for religious reasons. 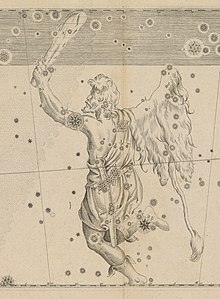 Early star charts were used for all these purposes. Even today, they are used for both astronomy and astrology. In the renaissance, with its interest in ideas, hundreds of books were printed with star charts and other diagrams. The key point for scientific charts is the use of data taken from observations, and listed in tables or databases. Historically, the first tables were in Ptolemy's Almagest (~AD 150). It has the last known star table from antiquity, with 1,028 stars. ↑ Carson J. et al 2012. "Direct imaging discovery of a ‘super-Jupiter’ around the late B-type star κ And". arXiv:1211.3744. ↑ Sasha Hinkley et al. "The Kappa Andromedae system: new constraints on the companion mass, system age & further multiplicity". arXiv:1309.3372. ↑ Hogben L. 1949. From cave painting to comic strip: a kaleidoscope of human communication. London: Parrish, p30. ↑ Frankfort H. Cylinder seals: a documented essay on the art and religion of the ancient Near East. 1939, London. ↑ Hogben L. 1971. Astronomer priest and ancient mariner: the beginnings of science. London: Heinemann. ↑ Heninger S.K. Jr. 1977. The cosmological glass: renaissance diagrams of the universe. San Marino, CA: The Huntington Library. This page was last changed on 17 May 2016, at 10:38.